Putting distance control and direction have a lot to do with face rotation. A lot of golfers don't understand that the putter face needs to be released just like any other golf club, and that requires some rotation. Obviously not to the same degree, but if you want to control your distance and get your putts to come out on line and roll true rather than getting a lot of backspin, you need to deloft the putter rather than adding loft like most golfers do. Most golfers have the putter face working up, coming through impact in an effort to keep the face square to the line. From the golfer's perspective it looks like they're squaring the face. If you're hitting a short putt you obviously want to be very accurate. You don't want the putter face moving all over the place, so a lot of golfers let the left hand break down. If you look down at that flip while you're doing it, it looks like you've succeeded in keeping the putter face pointing at the target. But, just like in the full golf swing, you don't want to let that wrist break down. A couple of things happen if you do. First, when your wrist breaks down and the club head passes your hands, you lose control of the putter face. When you let the club head pass your hands in a full swing it's a flip, and you lose control of the club. The same is true in putting. As soon as you start breaking the wrist down, not only is the club head passing your hands, making direction control difficult, you're also going to struggle with distance control because the loft on the face is inconsistent. If you get a little twitchy or nervy and you get a little right hand in there, things break down even more. Regardless, flipping is inconsistent and you'll do it differently every time. The putter face may have 4° of loft at address and 6° at impact - some of the time. Other times it might have 8°, and still others it may have no loft at all. The amount of loft on the putter face dramatically affects the way the ball is going to roll, and if it's different every time you'll never know what to expect. You'll also find that because the putter face is always working in what would be considered a V shaped pattern (it's not literally a V, but it's a steeper release point) the putter face is working back up through the ball and you're going to catch it on the bottom of the face a lot. Your putting stroke is inconsistent because the putter head works back up as you let the left wrist break down to release the putter. You catch it a little bit too much on the upswing, low on the face, and you can't hit the ball solidly. You're also flipping it, and that's going to send the putter face kind of out of control. If you don't hit your putts very solidly and you catch the ball on the bottom of the face a lot, you're going to really, really struggle with distance control. Believe it or not, you need rotation to square the face and actually deloft through the stroke, just like in the full swing. Obviously we don't want you to hood and pull it, but the club face is working on an arc, and it needs to rotate naturally around that arc. What About "Straight Back & Straight Through?" A lot of golfers have misunderstood the idea that the putter face should work "straight back and straight through." The only way to literally swing the putter straight back and straight through without manipulating it would if the shaft were perpendicular to the ground, and you were perpendicular to the shaft. You'd have to bend all the way over to actually swing back at a 90° angle. That's just silly. Even if you did that, you would still have to rotate your hands to keep the putter face square! You would have to rotate you hands slightly going back, as shown in the center photo above. Then you'd have to flip or rotate or do something going through (right photo) to keep it square. It just doesn't work that way. The putter always works on an arc because of your inclined spine angle and the length of the shaft. It needs to open and close naturally as it works around and back through on that arc, just like the full swing. This is a very different concept of putting than a lot of golfers are used to. It helps to understand how that works in terms of what your body does to get a true roll on the ball and keep the loft much more constant. Rather than adding loft, you're actually going to feel like you're taking a lot of loft off the putter. First of all, you need to stop letting the left wrist break down. We don't want that at all. What you want to feel is that the two bones in your left wrist just rotate a very small amount. The putter will already be working on an arc. You're going to allow the putter face to release by allowing those two wrist bones to rotate. Let's look at the flip. When the left wrist breaks down you flip the club, causing the putter face to rotate. Because the putter travels on an arc, by the end of the stroke it should point left of the target. That's counterintuitive to many golfers, so they flip the club it in an attempt to keep the face pointing toward the target throughout the stroke. From the golfer's perspective, the flip does appear to keep the face pointing at the target, as you can see in the photo below. Flipping in the follow through also works the putter face high off the ground, and adding all that loft increases backspin on the ball. Rather than flipping the club, you want to feel like you start closing it down. A good way to describe it is that you feel like the putter face is working low to the ground through the stroke. Instead of ending up high off the ground in the flip, you want to feel is that your rotation releases the toe and it all stays much lower to the ground. When you do that, you'll find that you have a much shallower stroke and you'll be able to hit the same point on the putter face every time, which is good for your overall consistency. You don't want the putter to come bouncing down off the ground steep and then release steep in that "V" shape we mentioned earlier. You want to stay shallow back and through, and the only way to do that is to get a little bit of rotation. If you struggle with distance control, this is going to dramatically change how you get the ball to roll. When you learn to release the putter face through the stroke you'll have much more consistent loft. You're also taking loft off through the stroke, so the ball will have a lot less backspin and will roll truer, and you'll hit the ball very solidly, which is critical for distance control. If you struggle with distance control and inconsistent putts, work on releasing the putter face and your putting will improve dramatically. 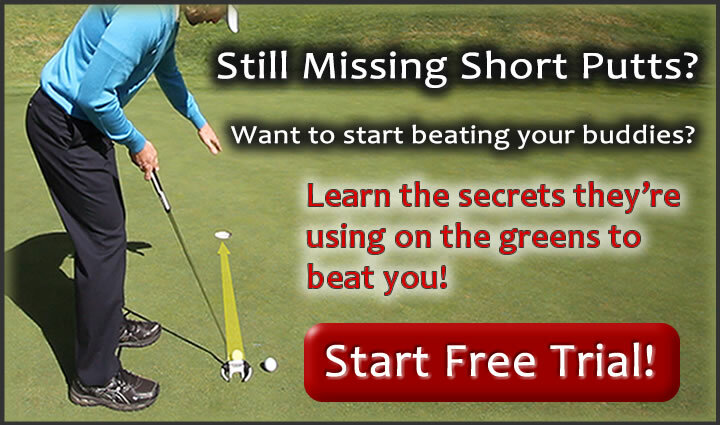 Get Your Free Membership to Watch "Releasing the Putter Face" Right Now!